Yes, that is what is peeking out at you, here from behind the leaves. Originally, this post started out in an entirely different way. I was planning to confess that I am a bit of a plant snob. Not the kind that avoids commonly grown plants. I love Epipremnum (pothos), Sansevierias and most Dracaenas just as much as I love the rare and the unusual. Rather, I was going to say that I’m the type of person who has high standards regarding the appearance of plants, both mine and other people’s. 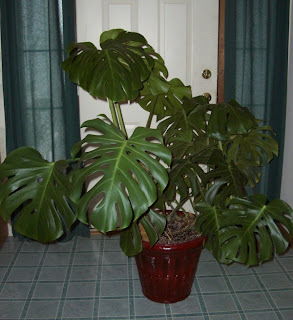 I was going to say that on occasion, when people on plant forums would proudly post pictures of their plants, and others would praise them, I would wonder: “That is what other people consider to be good-looking plants? Really?” Many of them seemed to me to needed pruning, or grooming, or more suitable pots, or, most commonly, a lot more light than they were getting. Just this weekend, something happened to change that. I had an exchange with someone who has really high standards for plants, and I found myself defending, (more in my mind than in the exchange itself) the beauty found in all plants, whether they are show-worthy specimens or not. The true joy I find in plants is in growing them, tending them, learning their likes and dislikes, and feeling a connection with living things–not in producing a perfect specimen. When I look at a landscape, I see a vista of pure beauty, not the flaws of each individual plant. Don’t get me wrong: I’m not going abandon all standards and discernment. Plants should be healthy, and I love looking at exceptionally well grown show plants. I love it when one of my plants looks really healthy and pretty. I’m definitely going to hold with my opinion that getting them into more light would do a lot of people’s plants a world of good. But I am going to try to be more open and encouraging, and less snobbish in my outlook. It is certainly not my best Sansevieria. The leaves are healthy, but the growth is kind of sparse. It’s okay, but it isn’t a plant I’m proud of, exactly. But what surprised me most is how many compliments he received from his coworkers. And the great pride he took in telling them that the plant was one of my “rejects.” Apparently other people are way ahead of me in seeing beauty in something green and living. And even more special, the love of my life thinks that I have a gift with plants, and he is proud of that. This post has meandered a bit, and I attribute that to the rather pensive mood I’ve been in for a couple of days. (I also suspect that I’m coming down with something.) But for me writing this has been an exercise trying to discover how to combine a discerning eye with an appreciation of the imperfect here in my life among the leaves. A bit of imperfection: Some of the ivy leaves have mite damage. I was a trifle embarrassed by that when I posted a different version of this picture last week. However, the cat wants you to know that he is, in fact, perfection itself. Edited to add: The pictures of Bob's work plant were taken by Bob himself. Thanks, sweetheart. For me, it depends a lot on the plant in question. With quite a few of them, I'm pretty happy if I can just keep them alive, and looking pretty is very beside the point. Others get a pass on appearance because they were rescues from work or from Lowe's, or because they're brand-new starts, or whatever. I guess what I'm saying is that my standards vary with the individual specimen, because my basis for comparison is what the plant used to look like, or what previous specimens of the same plant have looked like, instead of to other people's plants or the plants at the garden center or whatever.